Read to your toddler twenty minutes every day. You can break up the time in shorter segments. The important thing is the read every day. You might begin with wordless picture books where you and your toddler make up the words to go along with the pictures. Next look for books that have rhythm, rhyme and repetition. These books are easy for your child to memorize, and your toddler will be able to pretend read the stories to you. Whenever possible, help your child become the teller of the tale. 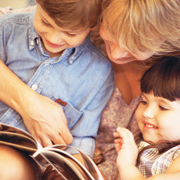 Find books that are of particular interest to your toddler, and read them again and again. Toddlers love the predictability that comes from hearing the same story, song or refrain over and over. By repeating the same story (words or phrases) you rapidly reinforce specific neural pathways that link sound and meaning in your toddler's brain. Read simple alphabet books to help your toddler develop letter knowledge. At this age, you may choose to stay away from books about creatures like monsters, pirates and ghosts, as your toddler has a hard time distinguishing between fantasy and reality.